These cats are descended from domestic cats, the offspring of lost and abandoned pet cats. Also from other ferals who are not spayed or neutered. Many of these cats are born and live without any contact with humans. Any environment sustaining people can sustain feral cats. They are known to thrive in urban, suburban and rural areas in all parts of the civilized world. They are not to be confused with wild cats or with stray cats (alley cats). Wild cats are descendants of wild species. Stray cats are homeless or abandoned domestic cats. Unlike ferals, strays have had prior contact with humans and exhibit temperament similar to that of domestic cats. Stray cats are accustomed to contact with people and are generally tame. 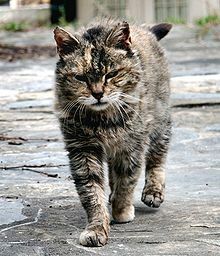 Feral cats are not accustomed to contact with people and are too fearful and wild to be handled. Females can reproduce two to three times a year and their kittens, if they survive, will become feral without early contact with people. Cats are extremely adaptable and feral felines have been found in conditions of extreme cold and heat. These cats may live alone but are usually live in larger groups called feral colonies. The colonies seem to meet two essential criteria. A good hiding place (often a small wooded area, abandoned buildings or cars) and sources of food. They are often seen by restaurant dumpsters. Feral cats generally fear strangers and it is likely that people may not realize that ferals are living nearby because the cats are not often seen. In urban locales with high-rise housing project tenements, as in Eastern Europe, feral colonies typically inhabit any residential building basement with exits suitable to cats (ventilation holes, anti-flooding drains, sufficiently large cracks, loose bricks, etc.). More so when the building itself is public property and lacks an owner who would wish to address the issue.. The average life span of these cats that survives beyond kittenhood is about two years for individual cats and five years for cats in a managed colony. Trap-Neuter-Return (TNR) is a non-lethal strategy for improving the lives of feral cats and reducing their numbers. At a minimum, feral cats who are TNRed are spayed or neutered so they can no longer reproduce, vaccinated against rabies and surgically ear-tipped on one ear (ear-tipping is the universally-recognized sign of a cat who has been TNRed). Dedicated caretakers feed and provide shelter for TNRed cats, monitoring the TNRed cats for sickness and remove new cats for TNR if feral or possible adoption if tame. When these cats are trapped, neutered and returned to their territory, they no longer reproduce. The cessation of sexual activity eliminates the noise associated with mating behavior and dramatically reduces fighting and the noise it causes. Neutered ferals also roam much less and become less visible and less prone to injury from cars. Foul odors are greatly reduced as well because neutered male cats no longer produce testosterone which, when they are unaltered, mixes with their urine and causes the strong, pungent smell of their spraying. Sharp increase of flea infesstation. Many people see a roaming cat and start feeding the cat even though many communities have feeding bans meant to discourage feeding. Ideally, the person quickly does more to help the cat: If the cat is tame, the person should take steps to find the cat's owner. If unsuccessful, the person should take steps to find a permanent home for the cat. Once a cat or colony of cats has been TNRed, a dedicated caretaker provides food, water and shelter, monitors the cats for sickness and removes new feral cats for TNR or new tame cats for possible adoption. TNR is a strategy that many dedicated caretakers pay for out of their own pockets to help improve the lives of these cats and reduce their numbers. Without TNR and a dedicated caretaker, the population of the colony would continue to increase. Is it better if these cats were euthanized? Probably not. More and more people feel sorry for ferals because of their difficult and dangerous life. Others are annoyed by the cats behaviors and want the them removed. Many people don't believe cats should be euthanized. Even if there were enough people and money to remove and euthanize them, other cats of this type would move into the vacant territory to take advantage of the food source and shelter now made available. The cycle is endless. The alternative is Trap-Neuter-Return. When the cats are TNRed, their health improves because they no longer have kittens and fight over mates, and nuisance behaviors are greatly reduced or eliminated. e colony's dedicated caretaker provides food, water and shelter, watches over the health of the cats and removes any newcomers for TNR (if feral) or adoption (if tame). TNR improves the quality of life for existing colonies, prevents the birth of more cats and reduces the number of cats over time. Additionally, many groups that provide resources for TNR have calculated that the costs associated with TNR are considerably less than those associated with removal, shelter care and euthanasia of feral cats. Animal shelters that receive complaint calls or calls of concern from the public may attempt to humanely trap and remove feral cats. Or may provide information and loan traps to citizens interested in humanely trapping these cats. If there is a local group helping the cats, the shelter may refer callers to that group. Feral cats brought to the shelter, especially those who cannot be identified as members of a known TNRed colony, are likely to be put down right away or after a mandatory holding period. It is difficult to accurately identify a feral cat without a holding period, yet safely caring for these cats in a typical shelter cage, is very stressful for the cat. If space is limited at the shelter, an adoptable cat may be put down to make room to hold a feral cat. How can people help these cats? Helping this type of cat can be very rewarding. There are many options for a person to be involved. First, a person may want to look for an existing feral cat group or individuals who are practicing TNR in their area to help learn the ropes. If there one or more feral cats in their area that does not have a caretaker, a person can become their caretaker. Feral cat caretakers practice Trap-Neuter-Return, feed, provide shelter, monitor the cats for any problems, trap new cats who arrive. If the new cats are feral, they are TNRed. If they are kittens young enough to be socialized or tame lost or abandoned pet cats, they are evaluated for adoption.